Personal Superstitions: a creepy list. Halloween is coming and I wanted to share some of my superstitions with you. If you walk under a ladder, a dinosaur will come and eat everyone. If you see a black cat, a dinosaur will come and eat everyone. If you break a mirror, a dinosaur will come and eat seven people. If you step on a crack, a dinosaur will come back and eat Annabelle, who concealed herself in a small gap between wardrobe and wall. If you don’t come back and eat Annabelle, you are not a good dinosaur. If you are not a good dinosaur, everyone will laugh at you. If everyone laughs at you, you won’t have very high-self esteem. If you don’t have very high self-esteem, you might mistake sadness for hunger. If you mistake sadness for hunger, you might, one day venture to a house, a normal house, where a girl is reading a book. If you like to read books too you’ll think. And maybe she could be a friend of mine. If you lift your hand to wave, it will be small, so small in comparison with your body. If you gaze at it in the dull light of the evening, as night claims day, the fear will come to claim you. If you wonder that, your claws, independent of you will clutch towards your window friend, and she will see you, maybe or the first time. If she sees you, large and cruel and splendid in the night, distaste and fear will flicker across her features. And you will see. A shame will grow in you. And it will flower. If it flowers, the rage will bloom in you, and you’ll remember little else for hours. The warmth of it, the comfort of your escalating cruelty. You’ll come to inside the house much later. And if they do, you’ll wonder what they taste like. And if they don’t you’ll wonder what they taste like. And if you wonder, you have gone too far. And it has claimed you. If it has claimed you, you are an evil dinosaur. And I am sorry for you. 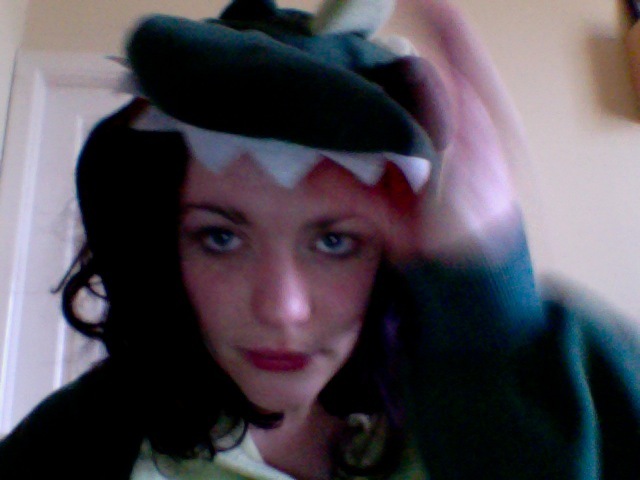 In other news, I am going as a dinosaur for Halloween. I am very excited about it. Tags: adventure, animals, Halloween, ideas. Bookmark the permalink. Previous post ← Where’s that Mojo gone? AH!! My arms are too tiny for my green body! Where did these scales come from???!! Laura, don’t panic. you might be a dinosaur. But you can still type. So it’s not too late!